The 2016 World Botanical EXPO, one of the largest horticultural shows in the world, kicked off with an official ceremony on Friday in Turkey's Mediterranean resort city of Antalya. 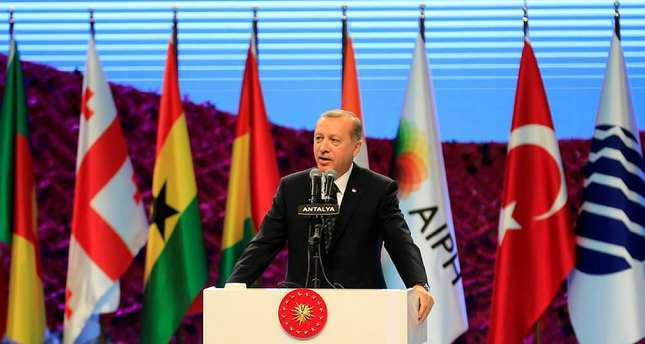 At the opening ceremony, President Recep Tayyip Erdoğan gave a speech in which he stated that the theme for the organization was chosen as "Flowers and Children" in order to realize a strong platform of dialogue among the countries in the region and the world. "EXPO 2016 is the result of the collaboration of our whole nation. Every piece in the exhibition has a specific importance," he said, adding that the organization taking place in Turkey's tourist hub Antalya has broken a record with the number of participant countries standing at 53. "As we do not see nature as inheritance from our ancestors, we are trying to do our best to protect it for the upcoming generations. We have increased our forestland to 22 million hectares and planted over 3.5 billion trees," he added, further stating that Turkey is home to 12 thousand different species of plants, %32 of which are classified as endemic. Touching upon the April 23 National Sovereignty and Children's Day, he said that the national holiday is the only holiday in the world dedicated to children. Further emphasizing the importance of the fight against global warming, Erdoğan called upon the global community to take concrete steps against the ever-growing problem of climate change. The expo, hosted by Turkey for the first time in the event's 160-year history, will last six months, from April to October, and will take place on a sprawling, 121-hectare exhibition site. The expo, with the aforementioned theme "Flowers and Children" and the slogan "A green world for future generations", is meant to promote Turkish history and cultural diversity as well as its rich agricultural and economic potential. The expo features national and international events such as concerts, congresses and symposiums, dance shows, musicals, plays, workshops, streets shows, and special events for national days and the holy month of Ramadan. Up to 8 million visitors are expected to visit the six-month event. Beside green areas, the expo has a special "Turkey's Eiffel" Tower, a lake, a biodiversity course, kids island, glass bridge, agriculture and biodiversity museum, science and technology center for children as well as food courts, amphitheaters, watermills, and gardens from participating countries. The expo also displays horticultural varieties and products from abroad, especially vegetation and green culture. The expo will boast 25,000 trees from 120 different species. Besides a 650,000-square-meter green field, there is an 80-square-meter lake on the exhibition site. 300,000 square meters are reserved for visitors. More than 50 countries are expected to participate in the expo, including China, Japan, Nepal, Sierra Leone, Tanzania, Qatar, Uganda, Mexico, Zimbabwe, Burundi, the Netherlands, Germany, Hong Kong, Senegal, and South Africa, to name but a few.